Congratulations! You’ve started a brand community, and things kicked off really well. Maybe you started your brand community because you’ve seen your competitors do. Or someone in your team mentioned that having an online community is a great way to interact with your loyal customers and other stakeholders. Whatever the reason, you’ve made the move and that’s something worth celebrating for sure. You’ve realized that keeping the members of your brand community engaged all the time can be a bit of a hard nut to crack. The great news is that you’re certainly not alone with these struggles. Before we jump straight into the “how”, it’s important for us to start with some context. Understanding why brand communities exist, what they are, and what they are not plays a crucial role when it comes to ensuring that you have a clear strategy for increasing engagement. 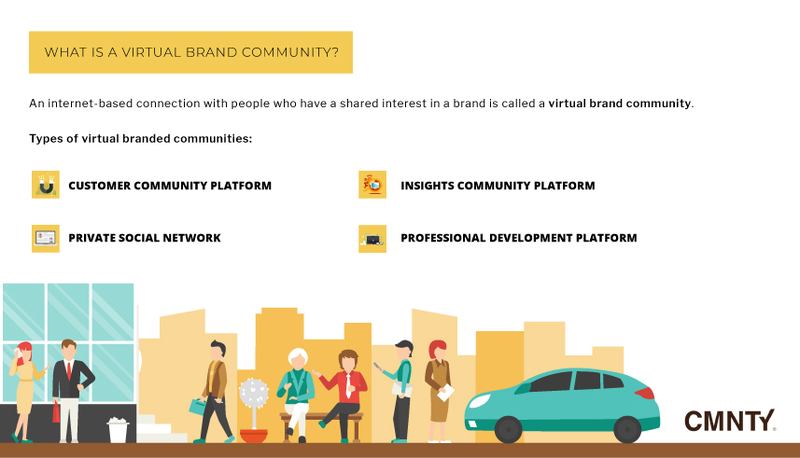 Chapter 1: What Is A Brand Community? To answer this, we must just in our time travel machine and go way back in our human history. Ever since humans started walking the earth, we have strived to connect with others, starting with those who are related by blood. The connection then widened to those who were in the same area.This birthed the concept of community. A brand community plays on this exact sense of wanting to belong. When people find out that they like the same thing, they talk about their shared experiences with that product or brand, creating a brand community. With the advent of the internet, you are able to find more people who like and use your brand even if they do not live in your same geographical area. This internet-based connection with people who have a shared interest in a brand is what we call a brand community. This short video clearly explains what a branded online community is and why they are relevant to us today. A brand community brings a lot of positives to the table. In the community, the customers talk about what they would like to change or what they really appreciate about your product. You can then adjust accordingly to make your product better. For example, one of our clients Profacts – a research company – helped a prominent radio station find out how the their audience perceived them. By using an online community, they were able to provide the station with actionable recommendations on how they could change and still remain recognizable. Brand communities also cut down your customer support costs. You are able to notice problems because they come up in the community before someone reaches out directly to you. Customers and advocates who are inside your community will naturally talk about your products and build up excitement, especially if you have a new product on the way. This will, in turn, lead to more sales. In fact, a study published in the Marketing Science journal showed that a strong online community raised a brand’s sales by as much as 20 percent. Brand ambassadors talk about the products to others who have not used them. In so doing, they are doing your marketing for you. Your brand community is a sure way to make your brand become a household name. Not all branded communities are the same. Depending on the outcome you expect, you can set up a variety of different communities. Let’s take a look at the different types. As the name suggests, this is a dedicated space online for your customers to interact. The primary purpose of this type is to increase customer satisfaction, retention and lifetime value. The platform is usually part of your company’s website and offers an easy way for your customers to join. 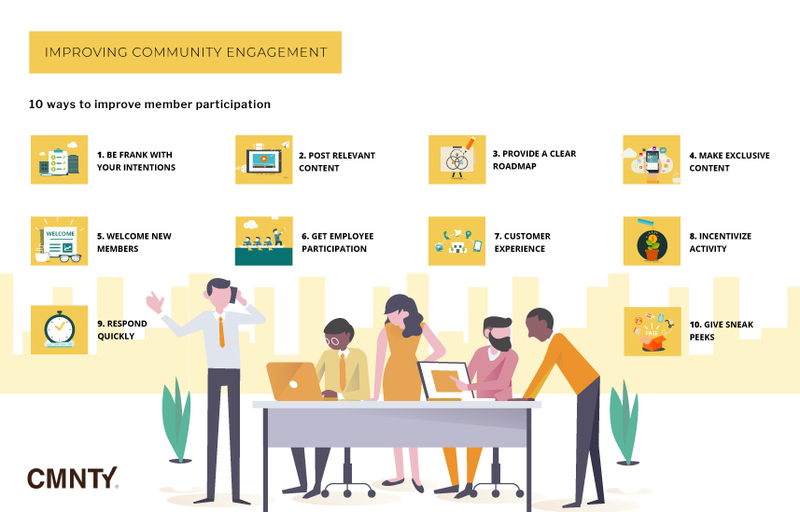 Your community team offers up relevant content as well as products to your customers, and tracks how users respond to and engage with the content and community. From ongoing interaction, you can build a lot of trust with your customers and become a standout brand for others to look up to in your sector. Want to conduct online qualitative research? What about building an online research platform for project-based or long-term studies, in less than a day? 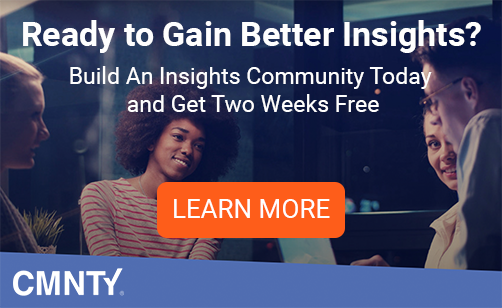 With an insights community platform you can make it happen. Now you can gather and present qualitative results quicker than using traditional methods. 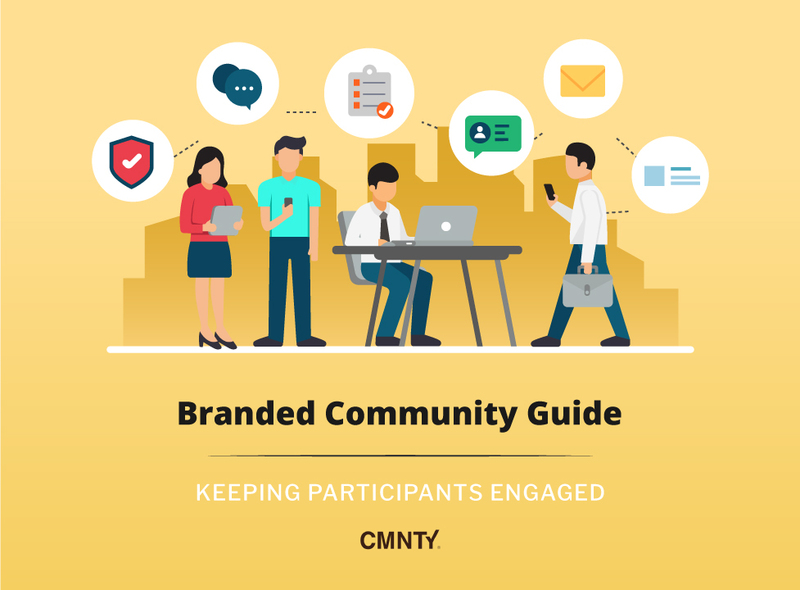 The members in this type of community are carefully selected to include brand loyalists as well as other stakeholders like employees of the company. You can gather top-grade feedback from these engaged members to further iron out any kinks in your product or organization. Related Post: Insights Community Platforms: How Do They Work? Members of a private social network can do just that.Members are selectively invited and go through a thorough screening process. This kind of restricted entry creates a sense of trust within the group where issues are discussed more openly. A professional development platform is a place online where staff or community members go to learn and grow together. As they learn from each other, they enrich their skills which they use to take your business forward. Did you know you can make online learning a lot more interesting and less time consuming? By allowing people to exchange experiences in an online community, organizations can become stronger and faster in solving problems. This type of platform also allows you to keep in touch with your employees, track their development and adjust accordingly, which motivates them (and you) even more. 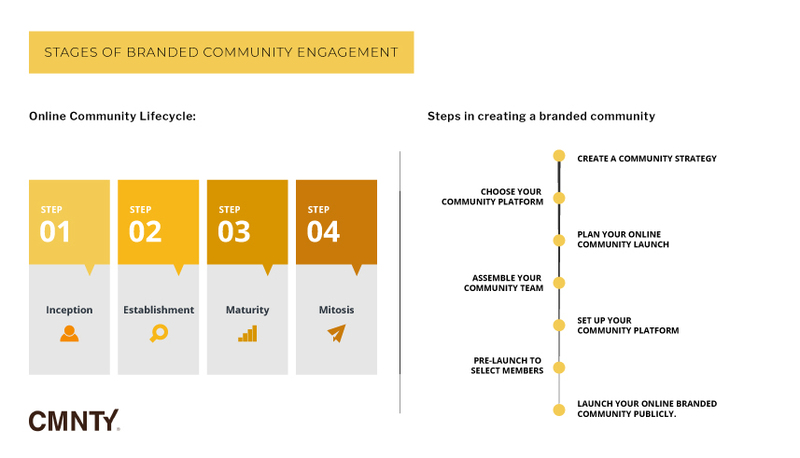 Your knowledge of engaging your community starts off with knowing the lifecycle of the online community itself. Managing an online community is a lot like building a fire. Stay with me here it’s a good analogy I promise! The team at Feverbee, expert researchers and consultants for online communities, devised an online community lifecycle model to describe how communities typically evolve. Let’s take a look at each of the stages of the lifecycle in detail now. This is the beginning of the group. To go back to our fire analogy, this is where you need to arrange your kindling and wood properly before setting off the spark. As the creator, you are very much involved in this phase. You actively invite members to join and create content for them to engage with. Furthermore, you need to build up your relationships with them so that they feel welcome to the community. The aim of this phase is to get the community to a stage where it can run itself without your community manager’s daily involvement (they’ll need to focus on other key activities instead – as per the ). You then need to cradle the fire, blowing on it gently until you get a steady flame. As more members join and participate, your community reaches a level where you can attribute more than half of its growth and the activity to the members. This is usually within 6 to 18 months of starting the community. In this phase, you should now focus on the bigger picture, leaving the micro level tasks of individual outreach. Instead, encourage the members to invite their friends and colleagues to join. You should also start planning for ways to handle the larger community so that your resources are not overstretched. Alongside this scaling, you should make sure your members feel that they’re a part of the community. For example, you can create a kind of hierarchy depending on the number of posts one has submitted. This makes members return to the platform and feel part of something bigger. Your community fire will rage as you continue to feed it fuel. When the community is fully established, it comes to a point where the users generate more than 90 percent of the content. At this stage – when it is around 2 years old – the growth of the community has maxed out. The community knows what it is and has developed a culture it identifies by. As the founder of the community, you are now interested in what’s good for the general group. You are, therefore, mainly involved in making sure the platform is properly optimized for the members. You are doing further scaling of processes to handle the volume and making sure that the community is now a beacon in your industry. Many of the known communities are in this stage of life. For example, Techcrunch is now known as the go-to for everything regarding startups whereas 4Chan is frequented by hackers and pranksters. This is where the fire splinters off and sparks new fires. Once the activity within the group is self-sustaining, the community is bound to divide itself into smaller groups depending on their interests. For example, the Mustang Club of America brings together owners of Ford Mustang muscle cars. However, they are further divided into different clubs based on their location. Despite the community name, there are clubs in Canada, Germany, Italy, Taiwan, Brazil as well as the Dominican Republic. In the general community, the activity increases as the members partake in the tasks within their various subgroups. As you can see, setting up and running a community is not something you do off the cuff. You need to know how far your community has grown so that you can manage it better. Now let’s look at another model that has been created that builds upon and adds to the online community lifecycle model above. 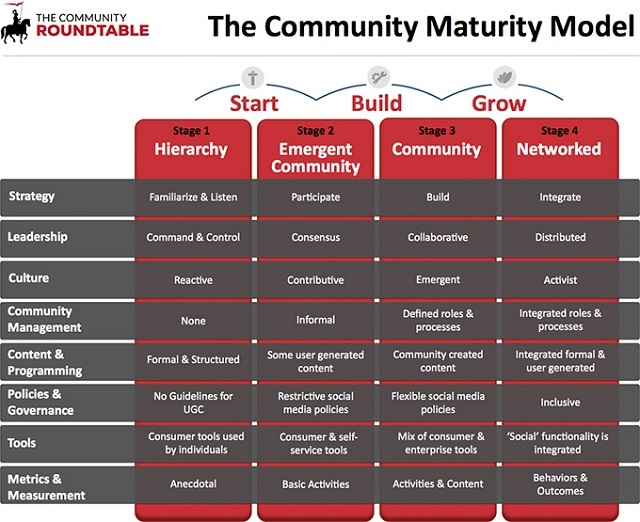 The Community Roundtable’s community maturity model helps you to further understand and plan for each of the four stages of your brand community’s development. It also helps your team to assess performance at each stage. 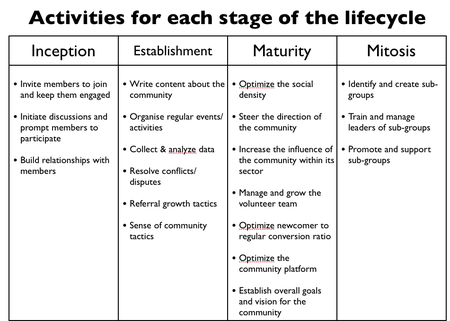 Below are the four stages and eight competencies that you need to be familiar with, and possess, as a community manager working through the stages. Notice how each competency functions differently depending on which stage of maturity your community is in. If you’re starting from scratch you could use an existing template to speed up the process. You’ll then need to choose a platform to host your community. You might want a community that provides information or one that is all about shared interests. Different platforms offer different features depending on the kind of community you have in mind. After you’ve chosen your platform, you should know your group’s focus and name. You need to put a lot of thought into this. This is what your community is going to be all about and what it will be known by. 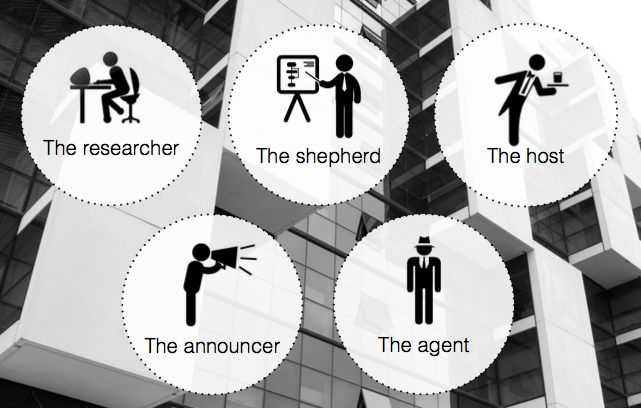 You should then identify the key stakeholders. This includes the personnel who will administer the group like the community manager, tech and customer support as well as marketing personnel. Other stakeholders include those outside the group who will be impacted by it. This is usually your business’ target market that might see changes in the product or service due to activity in the online community. You can then go ahead and set up the community, first by tailoring the platform to your needs. This involves creating the welcome message, testing the sign-up process, creating categories for content and proofing other technical aspects. An initial rollout should be next on your list. You can invite a select few loyal customers to test out the site and iron out any kinks you might have on the platform. Once everything seems proper, you can go ahead with a full launch, inviting members, posting content and promoting the community. 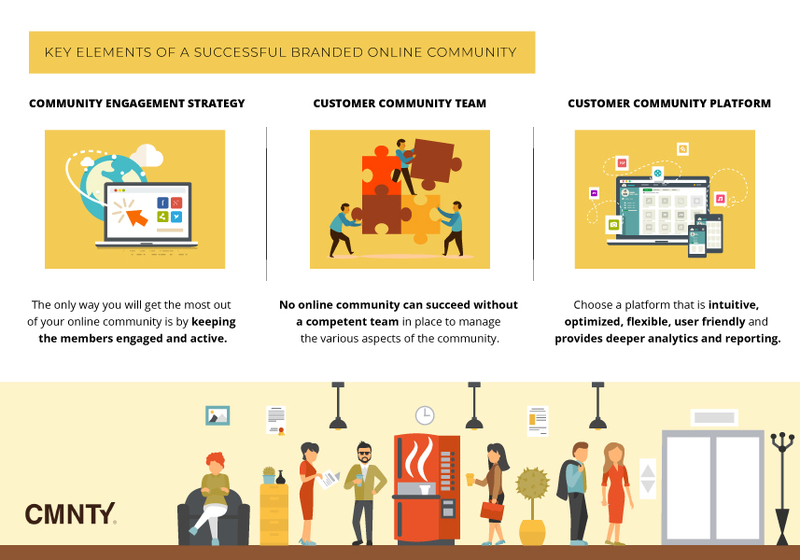 While a lot of different things will make a branded online community successful, there are three key elements that stand out. The only way you will get the most out of your online community is by keeping the members engaged and active. You should, therefore, have a strategy detailing how to communicate with them. A formal and robotic way of communication just won’t work in a community. Instead of issuing statements and releases, you should engage in two-way conversations. Listen to what the members have to say and reply in a more relatable manner. From listening, you are able to glean plenty of important information that will help you right the ship. Other than your community team members, it won’t hurt to have your CEO and other notable influencers in your industry pop into the community from time to time to engage with the members. This makes the members feel valued and it will drive up their levels of engagement. Microsoft’s Bill Gates, Vaynermedia’s Gary Vaynerchuk, and Apple’s Steve Wozniak have all done Reddit Ask Me Anything (AMA’s) in the past and leveraged the opportunity to create brand awareness. That’s just one way to address questions from your customers, and potential customers, who are not currently inside your community platform. No online community can succeed without a competent team in place to manage the various aspects of the community. You need someone in top management who is committed to the running of the community. This person oversees all the strategy being implemented in the community. Your community manager needs to be able to interact properly with the members, draw them out of their shells and moderate the discussions. This fosters higher levels of engagement. Whilst it may seem that a “community manager” has one function perform, in reality community managers must fulfill 5 management roles in order to get a community alive. The Host makes sure people feel welcome in the event and serves to foster the ambiance of hospitality. From the tone of voice to the projected feeling of good intentions, they create and maintain a welcoming space. It is vital that your people know that they are still on the right track. The Announcer is responsible for updating people on everything from progress to major and minor updates and tweaks in the community. The Shepherd is present to guide people in the right direction whenever they stumble upon an issue and have questions. The Researcher‘s role is to figure out potential concerns so that counter-measures can be fed back into the business and kickstarted into action if the need be. Finally, the Agent makes sure people are not spamming, promoting their own services or whatever you find inappropriate in your communities. Provides deeper analytics and reporting into the activities of your community members. With all that you have invested into your community, your team should have a quality platform that can grow as your community grows. Furthermore, your team should be able to know if you’re maximising your return on investment at all times. Even if you have a seemingly blossoming and buzzing community, you need to get in up close and see if your online community is progressing in the right direction. Is your online community positively contributing to your business goals? Whilst measuring the value of online communities can be difficult, there are some best practices that you can follow to calculate the ROI of your online community. There are a number of metrics that you can check out to gauge the engagement within your community. To get something out of your community, you need to know who exactly you are addressing. You should know the demographics of your community. And by this, we mean you should know if the member is already a customer or a potential one. Are they a singular person or a business? And if they are a business, what is the position of their representative in the community? In this way, you can tailor your content to their preferences so that the members appreciate and engage with it. This metric lets you know the community health status. Not medically, but rather the turnover of members in the community. Your community manager should, therefore, keep track of how many new members the group received in a week or month. They should also know how many left in that period. If any members have left, were they active participants or inactive ones? With this data in hand, you should be able to determine the health of the group. If it’s declining, you can go ahead and stimulate growth by inviting more members or conducting polls to find out how you can make the community better. 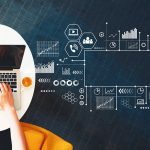 Community managers, with the support of quality data analytics functionality in your community platform or third party software, are in a good position to gauge the activity in the group. By constantly interacting with the members, they know which topics spark the most engagement. They also know which ones are the least popular. You can know if it’s becoming too monotonous and switch it up, adding video content where necessary. 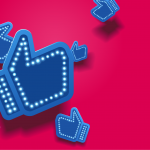 Adjusting your own engagement tactics to mirror industry trends is also a worthwhile activity. For instance, people appreciate video content more these days. The statistic below shows the high rate of growth of the number of people who watch videos on their mobile devices. With this knowledge in mind, how can your team produce more video content for your community or encourage members to post their own videos inside the community? Should You Chase Engagement Or Chase Value? Not all engagement behavior is supported. So measuring it is impossible and even when certain behaviors are supported, the data is not readily available. Most engagement analytics are architected around content or transactions, not people. This approach makes it very difficult to see people’s experience and change in behaviors over time. So the lesson here? Focus on generating ongoing value for your community members, and in turn (and over time) they will reward you. The numbers showing engagement may not be the best indicators of value given. That’s why it’s important to frequently communicate with your community members, and gather both qualitative and quantitative insights. Something else worth noting here – whilst it might not sound like it, 10% engagement on a community platform equates to massive success. Are you providing content that actually appeals to your members? Are they getting excited by it? How do you know? Have you implemented a gamification strategy to encourage and reward participation? Has your community platform user experience (UX) and user interface (UI) been set up so that it’s simple, fast and enjoyable for your members to interact with on their favourite devices? Have you made it quick and easy for your members to login, access the various functions they want to use, communicate with other members, and get questions answered quickly? Is your team focused on adding real value to the community and solving their human problems and concerns, rather than just focusing on metrics? Are you consistently communicating the bigger vision and mission of what you do, and why you created the community in the first place? Are you consistently highlighting the achievements of community members, sharing their stories publicly, and encouraging more members to share their own wins? When community members feel left out they will not participate in anything you have to offer. This brings us to something very important – member types, and how understanding the differences play a factor in engagement. Not everyone in your community is the same. Just as it is in real life, personalities are different when people go online. There are people who will not participate but will always watch on. These actually make up the bulk of your community, accounting for around 90 percent of members. You also have the new members, who need to find their bearings on the platform. You need to welcome and orient them so that they, too, can take part in the discussions. There are the regulars – always online and participating. Everyone knows them. Your community also has some experts, people who are very knowledgeable about the content that you put up. Many of them will submit content to be put up because they are thought-leaders in their fields. In a private community, however, the numbers of active users are typically higher. It still doesn’t cross halfway, though, maxing out at about 30 to 40 percent of members. So what strategies can you apply to keep your community members engaged? Based on our extensive research, and 11+ years of helping 15,000+ communities being built online, here are 10 proven ways our clients are doing it. An online brand community can certainly be a great idea to take your business to the next level. It can give your business a dedicated following. One that is as invested as you in the success of your brand’s bigger mission. You can gain insight into how the public views your product. And you can lean on your community to come up with ideas that you can implement that will improve your offering and give them a more positive experience. Choosing to focus on value generation more than simple metrics. Follow the tips above, with an underlying philosophy of experimentation and continued learning This way you will ensure a vibrant, healthy and successful brand community.